Star sewing box: a five-sided fabric-covered box, with two pincushions, and straps for storing your sewing supplies; an elegant take-long sewing box. 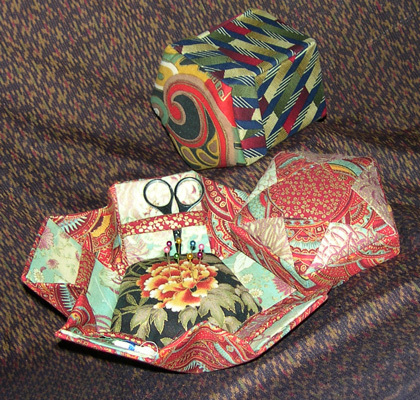 This can also be used as a jewelry case; earrings fit in the side straps and brooches sit in the pincushion. The novel webbed sides can be made up kaleidoscope-style; instructions are included in pattern.